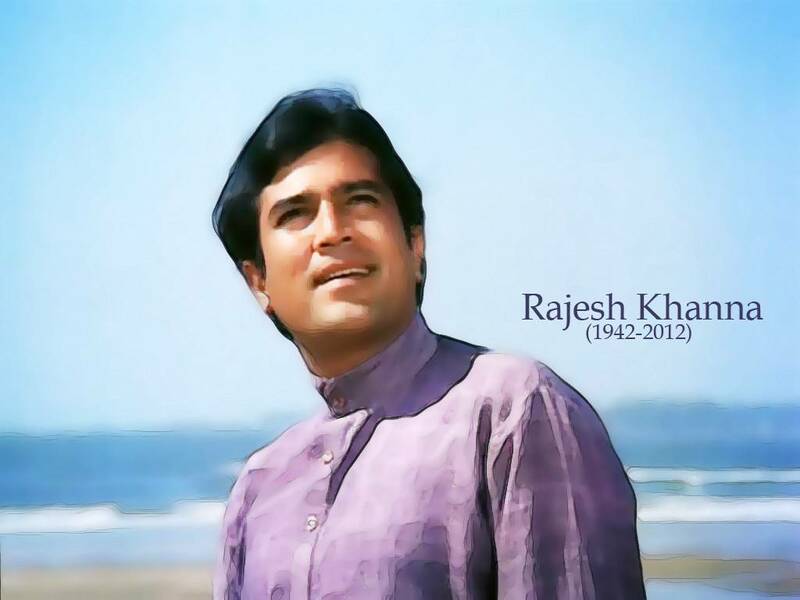 Rajesh Khanna Origional Name was Jatin Khanna (29 December 1942 – 18 July 2012) was an Indian actor, film producer and politician who is known for his work in Hindi Cinema. He was referred to as the "first superstar" and the "original superstar" of Indian Cinema. He starred in 15 consecutive solo hit films in the period 1969 to 1971, still an unbreakable record. He made his debut in 1966 with Aakhiri Khat Through his career he appeared in more than 160 feature films and 17 short films. He Had Own MG Sport Car to get work in theater and films in the early 1960s. Khanna did his first two years of Bachelor of Arts in Nowroseji Wadia Collage in Pune from 1959 to 1961. Rajesh bought Rajendra Kumar's bungalow named Dimple in Carter Road for 31 lakhs in 1970 and renamed it Ashirwaad. He was the highest paid Indian actor from 1970 to 1987 where Amitabh Bachchan shared the same tag with Khanna from 1980 to 1987. He was also a LokSabha member of the Indian national Congress from New Delhi constituency from 1992 to 1996. Rajesh Khanna was one of eight finalists in the 1965 All India Talent Contest organized by United Producers and Filmfare from more than 10,000 contestants. Khanna won the contest. BR Chopra, Bimal Roy, GP Sippy, HS Rawail, Nasir Husain, J. Om Prakash, Mohan Saigal, Shakti Samanta and Subodh Mukherji and others had created the United Producers' Combine and were the judges of the contest. He made his film debut in the 1966 film Aakhiri Khat directed by Chetan Aanand followed by Raaz directed by Ravindra Dave both of which were a part of his predetermined prize for winning the All-India United Producers’ Talent Competition. Being under contract with United Producers, he got projects like Aurat, Doli,Bahaaro ke sapne and Ittefaq. Movie Aaradhana Made Him First superstar Of the Indian Cinema. Aaradhana Was Instant Blockbuster That time. Rajesh Khanna was cast in a double role (father and son) opposite Sharmila tagore and farida jalal. It also saw the resurgence of Kishore Kumar, who eventually became the official playback voice of Rajesh Khanna. They worked together until Kishore's death in 1987 and songs of their combination were released until 1991. In 1971, he acted in Haathi Mere Sathi, which became that year's highest-grossing film and the biggest grosser ever till then. Khanna is credited with giving Salim Khan and Javed Khan their first chance to become screenplay writers by offering them work in Haathi Mere Saathi. Then In 1972 He Featured 11 Hits Films Like Amar Prem,Apna Desh, Mere Jivan Sathi and Dushman. Dil Daulat Duniya, Bawarchi,Joroo Ka Ghulam, Shehzada Was Also Be Hits Films.And A Movie Anurag Which was also Be Hit and he Praised For His Acting. Rajesh Khanna Acted With Mumtaz In 8 Movies and All Was Hits. His chemistry with Sharmila Tagore, MumTaz, Aasha parekh, Zeenat Aman, Tanuja and Hema malini were also popular with audiences.The BBC made a film on him, titled Bombay Superstar, in 1973. Rajesh Khanna had 15 consecutive solo hit films between 1969 and 1971.These were Aradhana, Doli, Bandhan, Ittefaq, Do Raaste, Khamoshi, Safar, The Train, Kati Patang, Sachaa Jhutha, Aan Milo Sajna, Mehboob Ki Mehendi, Choti Bahu, Anand and Haathi Mere Saathi. Between 1976 and 1978, Khanna acted in 5 box office hits and in nine films that were not commercially successful. Seven of the unsuccessful films were critically acclaimed and have achieved strong cult status over the years among the viewers.and these films included Mehbooba,Bundal baaz,Tyaag,Palko ki chavo Me, Naukari, Chakravayu and Janta Hawaldar. the unexpected success of Chhalia Babu gave a boost to the career of Khanna.Anurodh is Also be A hit Which Was Directed By Shakti Samant. After 1978, Khanna starred in critically acclaimed commercially successful films.such as Amar Deep,Phir wqohi Raat,Bandish,Thodisi Bewafai , Kudrat,Dhanwan,Avtaar, Agar tum Na Hote, Sautan,Hum Dono,Ram Avtar,Nazrana (from 1979 to 1991). Khanna performed in successful multi-star films including Raajput,Dharm Aur Kanta.In 1984, Maqsad was the second-highest ranked film in terms of box office results, earning 8.5 cr. He made a comeback Aa Ab Laut Chale(1999), andKya Dil Ne Kaha (2002) and played the solo lead in films Sautela Bhai in 1996, Pyar Zindagi Hai in 2001, Kaash Mere Hote in 2009, Wafaa in 2008 and Riyasaat in 2014. He did 4 television serials in the period 2000–2009. In 2013 Government Of india gave him Padmabhusan Award. Fimfare Awards - He Won 6 Filmfare award in his career.He won 3 best actor award for Saccha Jutha,Aanand and Aawishkar. Filmfare Special Guest Actor Award for Anurag. Filmfare gave him Lifetime Achievement Award. He Nominated For Many time For best Actor in Filmfare Including Aaradhana,Itefaq,Kati patang,Amar Prem,Prem Nagar,Avtaar ETC. Rajesh Khanna Won Dada Saheb Falke Award for His work To Indian cinema. 2008 Phalke Legendary Golden Actor Award at Mumbai on the occasion of Dada Saheb Phalke Birth day celebration. 2013 Title of First Superstar of Indian cinema bestowed officially. The First Superstar Of Indian Cinema and the Real Supersar. Copyright by buzz4you, 2006. Powered by Blogger.